Colin Miles of Save Domino spoke last Thursday when the project’s Uniform Land Review Process kicked off. 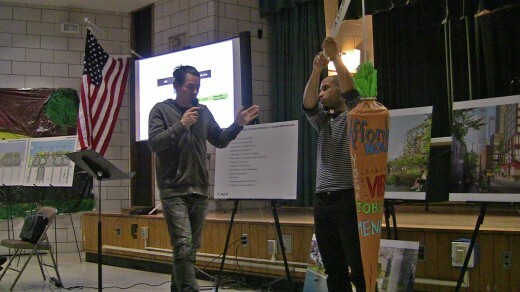 Last night, to demonstrate the project’s perceived lack of substance, he upped the ante and walked up to the mic at PS 84 carrying a large carrot littered with buzzwords (affordable housing, jobs, vibrant, amenity) frequently used by Two Trees, the site’s developer. Predictably, Two Trees principal Jed Walentas begged to differ. 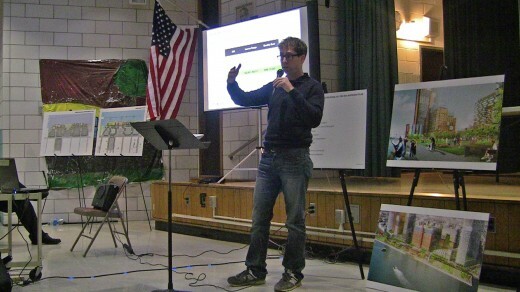 He reminded the crowd that, under the rules of the ULURP, the developer had no flexibility to alter the size and spacing of the plan, and maintained that the current proposal contains a 40 percent increase in open space as compared to the previous developer’s plan, which was approved by the community board. Walentas reiterated that Two Trees is willing to make a binding commitment to 660 affordable housing units (more than is required by law), though it needs government cooperation in the form of subsidized housing to do so. And he asserted that the plan’s accompanying office space will result in a decrease in L-train traffic, a point that was contested later. But while Walentas insisted the only options were between the previous developer’s plan and the “dramatic improvement” that is the Two Trees plan, yet another (albeit conceptual) plan is being floated by an opponent group, . Yesterday Architect magazine posted renderings of the Domino Culture Factory, a proposal for the site that would incorporate a “green-energy technology center,” educational facilities, 700,000 square feet of private museum space, theater space, a waterfront boardwalk, a sculpture park, a marina, and affordable housing. Last week, Miles told B+B that the so-called “alternative plan” had secured an investor should Two Trees want to sell the site, but he wasn’t ready to reveal the person’s identity. While there was no real push for a culture factory at last night’s meeting, some of the 15 speakers did call for more affordable housing. Other requests included Parks regulation of open space, a restrictive declaration with regard to the number of units, and improved sustainability requirements. 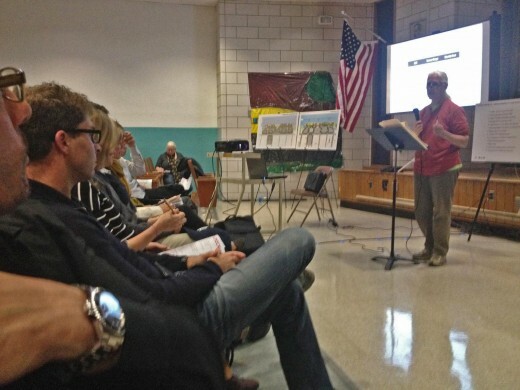 As part of a coalition of community leaders and organizations representing “a majority of residents from the south side of Williamsburg,” councilman elect Antonio Reynoso assured that a proposal of recommendations – which was requested by Two Trees – would be sent to the developers sometime today and would subsequently be released to the public through the community board. Stephanie Eisenberg, an active opponent to the Domino Development, likened the Two Trees plan to “the continuation of class warfare through rezoning.” But nobody was applauded louder than community member Amanda Crandall, a mother who emphatically claimed that the community did not need any more luxury housing developments along with the accompanying large population increase. The Community Board is set to vote on the new development plan on Dec. 10. However, whether or not the board votes to support the plan before it goes to the Borough President and then on to the City Council will almost assuredly not affect Two Trees’ impending development on the site.